Lying in your lawn chair, you look up and realize, “Man, my trees need a little shaping up.” Before you end your relaxation and start cutting away at your trees, take a deep breath. As with all things, timing is important. We have the how, when and whys of tree trimming to help you plan for the months ahead. A little year-round maintenance (light shaping) is fine to keep your trees healthy and looking great. If you want to really prune a tree back, be sure to do it at the appropriate time during their yearly growth cycle. This way, you can encourage the plant to grow fuller and produce more flowers and fruit. An arborist can help you make the right decision on which branches to cut and which to save. So when is the best time to trim a tree? Winter months are when the tree is dormant. Pruning during this time will promote a generous burst of new growth come spring. Just wait until the coldest weather has passed and you should be fine. If you want to do some corrective pruning to a tree then do this in the summer months. By cutting a tree limb back during the summer part of their growth cycle, you are helping to slow the development of new branches. This is the time to take out low lying limbs so they will not readily return. Wait until after the fall to do any tree trimming. Because fungi spread their spores profusely during the fall, cutting a tree limb in the fall will make them susceptible to these diseases. Trees also heal slower during these months. Enjoy some football and wait. For flowering trees, if they bloom in the spring then you should prune them after they finish blooming. If they bloom mid to late summer then trim them back in the winter or early spring. This will help you avoid trimming off any buds that the tree is forming for next year. 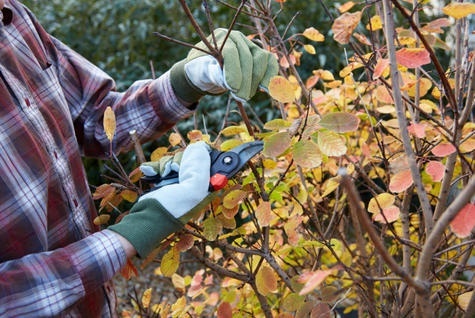 Some good tips for pruning any time of the year is to always use sharp tools. They will make cleaner cuts on the trees and will help the tree heal faster. If you have high branches use a pole pruner instead of trying to climb on a ladder. It is too easy to tip over when sawing a limb. Chain saws can help you take down many of your branches, but for large overhead branches play it safe and call in a professional. Check out our blog, How to Cut down a Tree, for more helpful suggestions on using chain saws. As summer winds down, don’t stress over trimming back your trees. Make small adjustments here and there and save any major trim work for the winter months. Enjoy the dog days of summer and the wonderful shade your trees provide. Our expert staff is always on hand to help you with your yard and garden projects. From tree pruners and nippers to chain saws and wood chippers, if you have any questions about what to choose, pricing or how-to’s, don’t hesitate to contact us. Stop by our store — we’re open seven days a week.